FRIENDLIEST CITY IN THE USA! HOW DO YOU MAKE A GAME ABOUT THE GREAT CITY OF KEYSER, WEST VIRGINIA? While it’s impossible to include everything, we jammed all the Keyser we could into this box.It’s full of family fun, outdoor activities, historic charm, and of course…Green Mountain - a little something for everyone! Looking for a fun way to experience this incredible city? HERE’S A QUICK IDEA OF HOW TO PLAY! 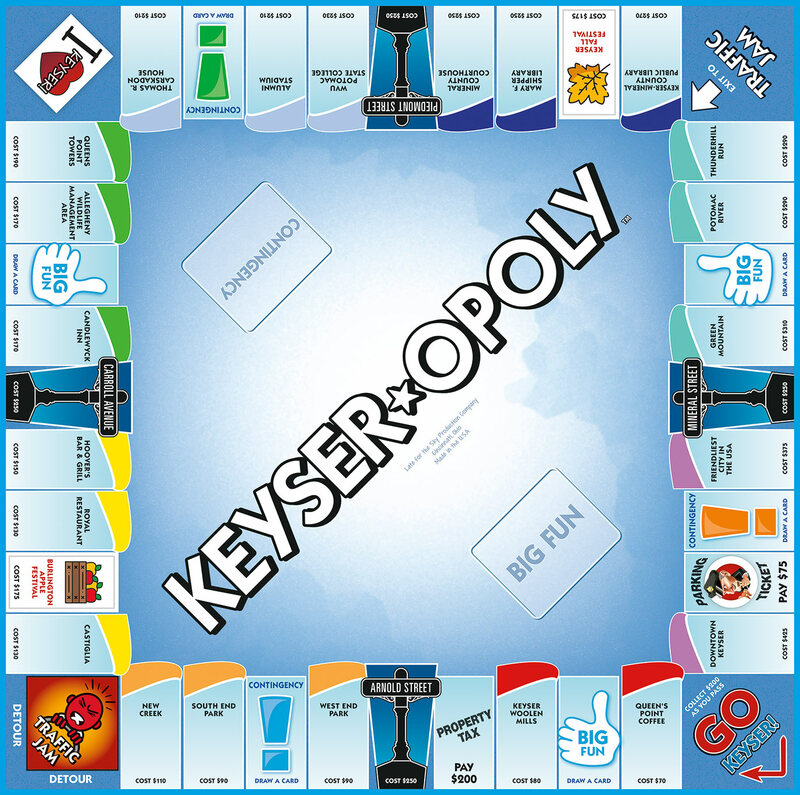 Buy your favorite Keyser properties, increase your rent by collecting City Blocks and trading them in for Keys to the City. Sound easy? Well, add in some traffic jams, property tax and parking fines and it gets a little more difficult and a lot more fun! GET YOUR GAME ON! Green Mountain - a little something for everyone! Looking for a fun way to experience this incredible city? Choose your token and advance to GO KEYSER! You may soon be the Mayor…or out of the game for eating too many sandwiches at Hoover’s Bar & Grill! THIS IS KEYSER.... AND IT’S YOUR ROLL!